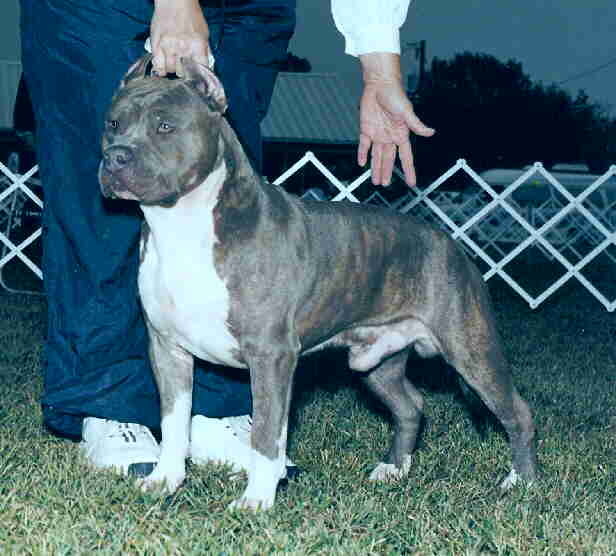 "TONKA" DIED OF OLD AGE IN 2008. HE IS SORELY MISSED BY THE TROUTMAN FAMILY. "IT HAS COME TO MY ATTENTION THAT PEOPLE ARE INBREEDING ON "TONKA" AND USING THIS WEBSITE TO SELL THE PUPPIES. "HE WAS DIAGNOSED WITH IT BY A DOG CARDIOLOGIST AND THE PEOPLE DOING THIS BREEDING WERE NOTIFIED AT THIS TIME AND TOLD TO TEST THEIR DOGS OUT OF HIM WITH A CARDIOLOGIST. ALL BUT 2 OF THEM HAVE DONE THIS BUT THOSE 2 HAVE CONTINUED TO BREED AND INBREED ON HIM AND SELL THE PUPS TO UNSUSPECTING BUYERS. THOSE PEOPLE WERE BEN WOODHOUSE AND SUE WITH CH. SUE'S BLUE BEEMER. IF YOU ARE BUYING A DOG WITH TONKA IN THE PEDIGREE PLEASE ASK TO SEE THAT THE PARENTS HEARTS HAVE BEEN TESTED CLEAR OF HEART DISEASE BY A CARDIOLOGIST. YOU CAN DO THIS BY LOOKING THE NAME OF THE PARENTS UP ON MY WEBSITE OR GOING TO www.offa.org TO LOOK IT UP. I HAVE THEM LISTED ON THE OFA PART OF MY SITE ALPHABETICALLY. ALL DOGS LISTED IN RED WERE ONLY TESTED BY VETS WHICH IS NOT GOOD ENOUGH AS MOST VETS CAN NOT FIND THE MURMURS ASSOCIATED WITH HEART DISEASE UNLESS THEY ARE READY TO DIE OF IT. PLEASE READ ABOUT THE PROBLEMS IN THIS BREED AND IF YOU HAVE A TONKA PUP OR GRANDPUP THAT YOU WANT TO BREED PLEASE TEST IT TO MAKE SURE IT IS NOT AFFECTED WITH HEART DISEASE. PLEASE BE AWARE THAT THERE IS A TEST OUT FOR CEREBELLUM ATAXIA TOO AND MAKE SURE THE PARENTS OF THE PUP YOUR ARE BUYING HAVE BEEN TESTED. ASK TO SEE THE CERTIFICATES FROM OFA, OPTIGEN, OR ANTIGEN TO PROVE THE PARENTS ARE HEALTH TESTED FOR HIPS, HEART, AND ATAXIA.